After yet another death in the family — my Uncle Peter, just six months after his wife Nancy died — I really need something silly. I used to laugh a lot with Uncle Pete, and now I’m hoping you’ll laugh along with me with this blog that originally ran on GoodHousekeeping.com. By the end of the class, I’d learn how to warm down to a song written for head-bangers and how to read a clock backwards. It wasn’t exactly what I was looking for when I decided to take a Spinning class at the gym the other morning, but it was a good workout. Good, if you’re training to be chased by a herd of rhinoceroses. But really, I’m just hoping not to spill out of my swimsuit this summer. I thought I was being clever when I hid my cell phone in a towel on the handlebars of my Spinning bike before the teacher came into the room. I figured I could surreptitiously text people back during class. But that was before I met Alan, the substitute teacher who would maintain a mood for the class that can best be described as Your-Rear-Tire-is-Ablaze-and-There’s-a-Large-Puddle-Ahead. And you can’t text when you’re desperately trying to keep up with Alan. 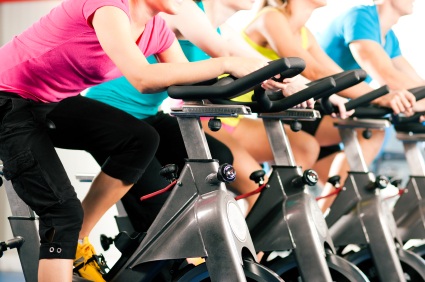 Unlike every other Spinning class I’d taken, there was no warm-up to speak of. No “Breathe in while you stretch to one side,” or “Now, the other.” There was, instead, a Lenny Kravitz song with wailing guitars and a pace perfect if you’d just robbed a bank and are trying to make a get-away by bike. Next, we followed Alan’s orders to “Keep moving!” to a song with a techno beat that could appeal only to hipsters on Ecstasy at an all-night rave. If we’d harnessed the power of all fifteen bikes racing at Alan’s “warm up” speed, we could have run the electrical grid for the entire gym. Though I’ve taken Spinning classes before, none had even come close to the intensity of Alan’s class. We sprinted, jumped and raced through song after song, until we were all panting and gulping down water. Well, all of us except Alan, who was shouting – and without the microphone that all the other teachers use. Before Alan’s class, I don’t think I’d heard “Sweet Home Alabama” cranked up so loud since I first got my driver’s license. And I’m not sure which looked more ridiculous: me as a Jersey teen singing an ode to the south out of the T-tops of my 1984 Camaro, or me as a middle-aged mom racing the men on each side of me on bikes that don’t go anywhere. There was no time to get all wistful at the lyrics of the songs. There was no time to glance at my cell phone. But there were another 20 minutes left in the class, and Alan wanted us to make the best of it, reminding us that swimsuit season was less than two months away. When we neared the final minutes of class, I sighed, grateful that the warm-down song would bring it all down a notch. I toweled off, chugged my water and got ready for some peaceful James Taylor or perhaps a little soulful Mariah Carey. Instead, Alan turned up “Welcome to the Jungle,” the lyrics of which promised to make me scream. Ah, but in Alan’s class, nobody can hear you scream. But they might notice if you pass out and fall off your bike. Finally, Alan instructed us to bring our heart rates down, perhaps from rabbit-escaping-a-fox to human-who-just-finished-the-Tour-de-France. We dismounted our bikes and breathed while we stretched to one side and then to the other. When Alan announced the end of class, there was nervous applause, like after the rodeo clown distracts the angry bull long enough to contain him. When I headed out of the gym, I stopped by the manager’s office. Between huffs and puffs, I eked out, “Alan’s Spinning class? Best I’ve ever taken.” And then I stumbled to my car, where I turned on the easy listening radio station on ever so low.